The causes of cat eye discharge can vary, and there are many problems and conditions that can cause this symptom. A small amount of discharge may be normal, and is comparable to sleep in your eyes when you first wake up in the morning. Feline conjunctivitis is another common discharge cause, and this is an infection of the eye that can cause pus and eye irritation. If this is the cause of your cat eye discharge problem then antibiotics will be needed to clear up any infection. No matter what the cause, any discharge should be gently removed with a soft cloth that has been moistened with warm water. Cat watery eyes and sneezing may be the result of allergies, and at times this can also cause a discharge to occur in your pet. Any cat eye discharge that is severe or has an unusual color or foul smell should be evaluated by your vet. Sometimes a cat may get into a fight with another feline, and a scratch can cause a cat eye infection that can become serious if left untreated. Feline respiratory disease can also cause a discharge that starts out watery and clear, but that will thicken and develop color over time. 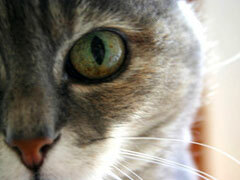 Blocked tear ducts, eye inflammation, and many other things can also cause a cat eye discharge to appear. Dry eye is another common problem with cats, and sometimes eye problems can be caused by a foreign object in your cat’s eye. You can try a cat eye infection home remedy, and there are many of these online. A warm compress may help with any pain and swelling, and you should never use anything but water and clean cotton balls to remove any discharge unless your vet has advised this step. Some over the counter creams and ointments may not work on cats the same way they do on people.